It is clear that most servers in data center can support Ethernet transmission of 40G, and 40G QSFP+ transceivers are considered to be the most economical solution for 40G transmission in data center. However, to make all these devices run normally and effectively, fiber patch cables must be used to connect the fiber optic transceivers which are plugged in Ethernet switches shown in the following picture. As the structure of 40G transmission is more complex than ever, the select of patch cords for 40G transceiver becomes more difficult. This article will focus on how to select the proper patch cords for 40G QSFP+ transceivers in details. 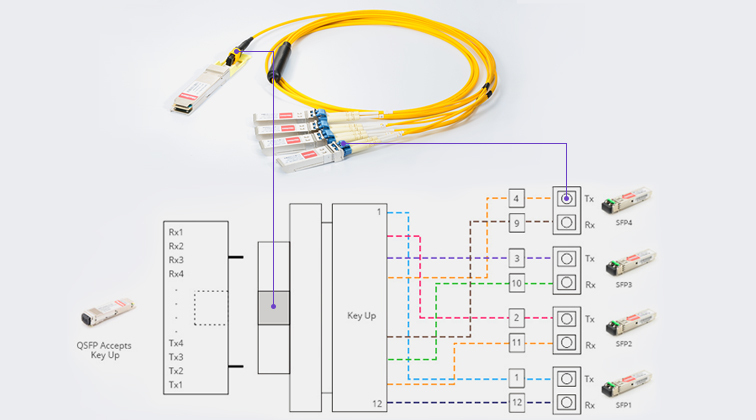 Numerous things need to be taken into consideration for proper selecting the fiber patch cables for 40G QSFP+ transceivers in practical cabling. However, several factors should always be considered: the cable type of the patch cords, the connector attached on the ends of the patch cords, and the ports of the switches that need to be connected. For the first factor to be considered is cable type. This is because of the transmission characteristic optical signals of the fiber optic. Optical signals performs different over different wavelength. And optical signals with the same wavelength performs totally different when they run through different types of cables. A question that people might come across can illustrate the above point well. Can a 40GBASE universal QSFP+ transceiver working on wavelength of 850nm be used with OM1 patch cords? Usually, signals with wavelength of 850nm are transmitted over short distance. 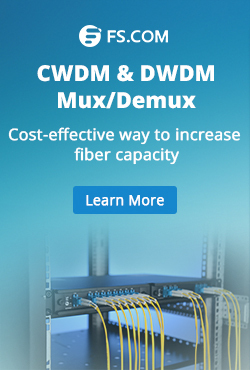 Thus selecting a multimode fiber patch cords would be more economical. However, OM1 patch cords, which are ususally suggested for 100Mb/s and 1000Mb/s, cannot support 40G transmission and the quality of the 40G transmission is bad. This is because the transmission distance reduced as the data rate raised. For this case, OM3 and OM4—the optimized multimode fiber optic cables for 40G transmission in short distance are suggested. OM3 can support 40G transmission up to 100 meters and OM4 can support 40G transmission up to 150 meters. The second aspect should be considered is the connector type that attached on the both ends of the patch cords. It usually decided by the interface of the 40G transceivers. Usually 40G QSFP+ transceivers for short distance are armed with MPO interface and for long transmission distance up to 10 km usually employ LC interface. However, there are several 40G QSFP+ transceivers do not follow this rule, like 40GBASE-PLR4 and 40GBASE-PLRL4. These transceiver with MPO interface can support transmission over long distance. The biggest characteristics of MPO connector is high density which seems perfectly satisfy the requirement of 40G transmission. However, for this kind of connect, the polarity becomes complex. Thus during the selecting of this types of patch cords. The polarity must be considered. For your reference, here offers another article which is informative about MPO polarity—”Understanding Polarity in MPO System”. The following pictures shows the commonly used 40G transceivers with MPO or LC interfaces. The third importance factors is the switch ports which is closely related to the applications. During the practical cabling, two situations are common. One is 40G QSFP+ to 40G QSFP+ cabling and the other is 40G QSFP+ to 10G SFP+ cabling. For 40G QSFP+ to 40G QSFP+ cabling: for distance up to 100m, the 40GBASE-SR4 QSFP+ transceiver can be used with OM3 fiber patch cable attached with a MPO one each end. For distance up to 150m, the 40GBASE-SR4 QSFP+ transceiver can be used with OM4 fiber patch cable attached with a MPO one each end. For distance up to 10km, the 40GBASE-LR4 QSFP+ transceiver can be used with single-mode fiber with LC connectors. 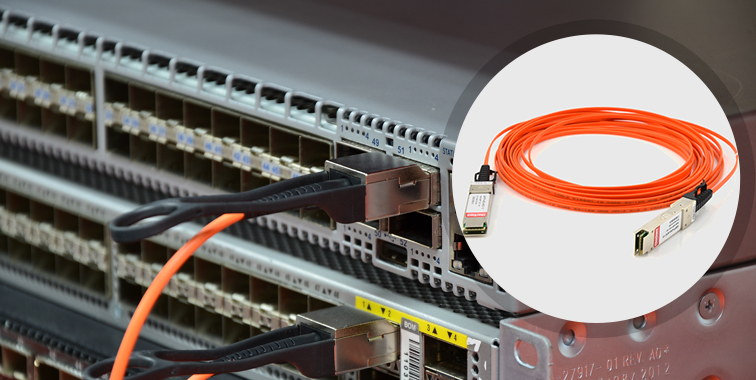 The picture above shows the transmission of 40GBASE-LR4 QSFP+ transceiver with LC connector over single-mode fiber. 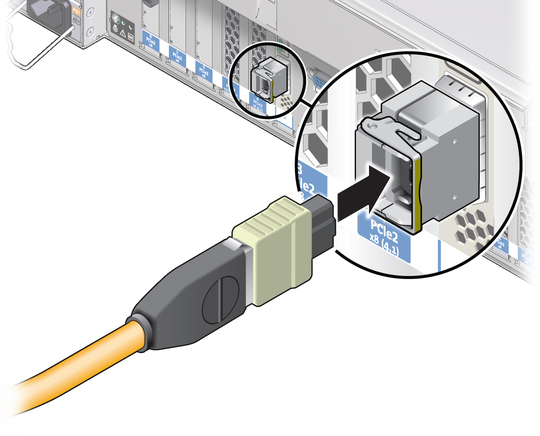 For the 40G QSFP+ to 10G SFP+ cabling, fan out patch cable with MTP connector on one end and four LC duplex connectors on the other end is suggested (as shown in picture below). In conclusion, three main factors must be considered are fiber optic cable type, fiber optic connector type and the switch port. In practical cabling, more should be considered. These three aspects are far from enough. However, FS can solve your problems with professional one-stop service including the cost-effective and reliable network designing and 40G products. You can contact sales@fs.com for more details. This entry was posted in Fiber Cabling, Fiber Optic Transmission, Fiber Patch Cable, Network Solutions, Optical Transceiver Solution and tagged 40G QSFP+, 40G QSFP+ transceiver, 40GBASE-PLR4, 40GBASE-PLRL4, Fiber patch cable on January 23, 2016 by Alice Gui. 10GbE (Gigabit Ethernet) is no longer enough for the increasing need for high speed transmission with applications like Big Data, Cloud and Internet of Things being introduced in a variety of industries. Transmission network migration to 40/100G has already been the industry consensus. As the cost for 100G is far beyond what most companies can afford and the technology for 100G is still not mature, there is still a gap to reach the transmission speed of 100 Gb/s. However, to satisfy the current need for data rate, 40G could be a better and more economic solution. Currently the servers in many data centers are ready to carry the transmission of 40 Gb/s. The core technologies of 40 Gigabit are gradually mature. In addition, more manufacturers are battling for the 40G market, which drives down the 40G deployment price. Unlike 1G migrating to 10G, 10G migration to 40 Gigabit get across a much larger span in terms of not only transmission data rate but also technologies. Thus, the deployment of 40G migration is much more complicated than that of 10G. Three factors should be considered to increase the reliability and manageability for 40G migration. They are fiber optic transceiver, transmission media, and pre-terminated MPO assemblies. Fiber optic interconnection is indispensable in today’s telecommunication network. Photoelectric conversion is a necessary part in fiber optic network. The function of fiber optic transceiver is photoelectric conversion, which makes it one of the most commonly used components in the data center. Without it, the data center cannot run normally. As for 40G migration, transceivers of two different package forms are commonly used: QSFP+ transceiver (Quad Small Form-factor Pluggable Plus transceiver) and CFP transceiver (C Form-factor Pluggable transceiver). QSFP+transceiver is more popular in 40 Gigabit application. A single 40G fiber optic transceiver may not be expensive. However, to a medium-sized data center, thousand of optical transceivers might be needed. The total cost on optical transceivers is a large sum of money. The switch market has already been monopolized. Luckily, the transceiver market is not. Third party transceivers that are compatible with a variety types of switches can be found in today’s market. 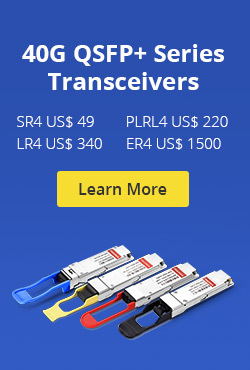 They have the same performances that the original brand transceivers have, but cost less money. Selecting compatible transceivers has become the choice of many data centers. Cost is one aspect that should be considered in 40G optical transceiver selection. Quality is also very important. Not all the third party transceivers are created equal. Selecting the compatible 40G transceivers from a company that assures 100% compatibility and interoperability is necessary. 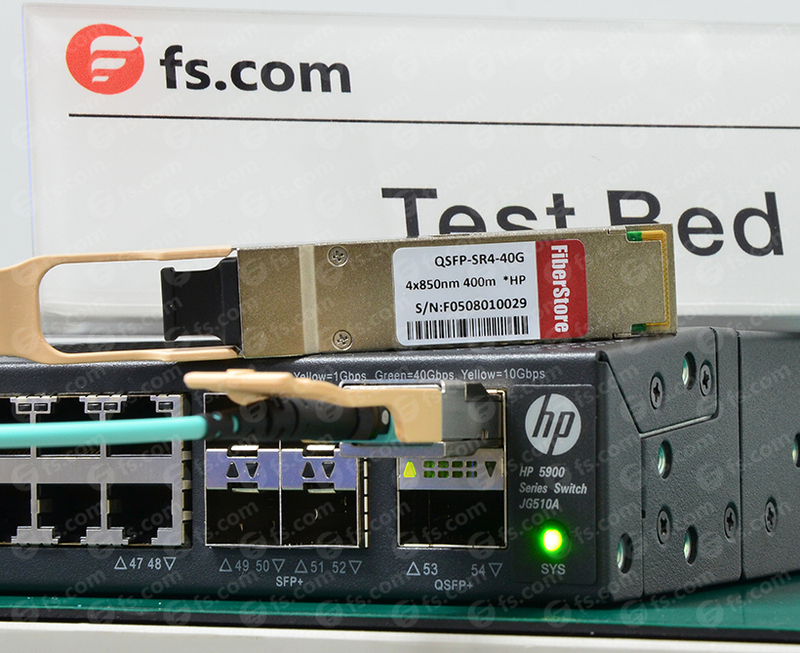 The above picture shows the testing of Cisco compatible QSFP-40G-LR4 transceivers on a Cisco switch to ensure its compatibility and interoperability. 40GBASE-CR4: 40Gb/s Ethernet over copper cable in short transmission distance. 40GBASE-SR4: 40Gb/s Ethernet over four short-range multimode fiber optic cables. 40GBASE-LR4: 40Gb/s Ethernet over four wavelengths carried by a signal long-distance single mode fiber optic cable. It comes to the old question: fiber optic cable or copper cable, which should be used in 40G migration? Copper is cheaper. But it can only support 40GbE transmission limited to several meters. Single mode fiber optic cable supports the longest 40GbE transmission distance up to 10 km. For multimode fiber optic cables, OM3 and OM4 are suggested to support short distance transmission. The longest distance that OM3 can support for 40G transmission is 100 m. OM4 can support a longest 40G transmission distance of 150 m. The selection of transmission media should depend on the specific applications. According to the IEEE standards, the 40G multimode Ethernet transmission uses four multimode fiber optic cables. The IEEE 802.3ba standard also specifies multi-fiber push-on (MPO) connectors for standard-length multimode fiber connectivity. Most of the 40G multimode Ethernet transceivers are based on the MPO technology. It is wise to increase fiber optic density by using MPO technology, but a new problem is coming up. As the fiber number increased, the cabling and splicing difficulty in data center increased. Unlike traditional two-strand fiber connections, MPO connectors cannot be field terminated easily. Most of the data centers choose the pre-terminated MPO assemblies (as shown in the above picture) in 40G deployment, which is more reliable and can save more human labor. Before cabling, determine the cabling lengths and customized pre-terminated MPO assemblies with manufacturers would save a lot of time and money. Selecting a compatible third party transceiver of high quality in 40 Gigabit transmission would save a lot of money. Combining specific applications and characteristics of 40G transmission media, would help to determine the most economic and reliable 40G deployment plan. Pre-terminated MPO assemblies are necessary for flexible and manageable cabling in 40G deployment. 40G migration is happening now and it will become a milestone in the history of network transmission. This entry was posted in Fiber Cabling, Network Solutions, Optical Transceiver Solution and tagged 40G, 40G QSFP+, MPO/MTP Assemblies on January 16, 2016 by Alice Gui.